Want to supplement your Mediavine ad income? 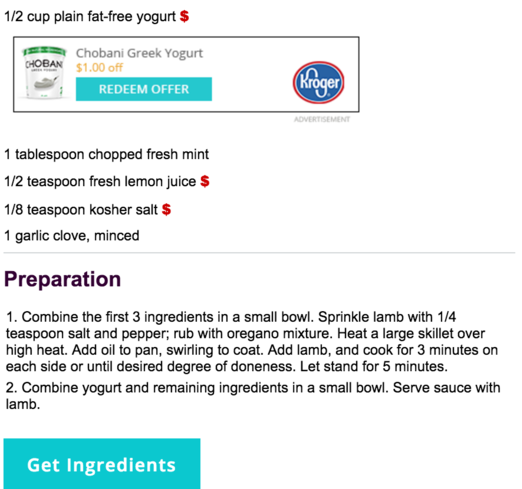 Do you have recipe content? Check out our Chicory integration! Chicory is a food-tech company that makes recipes shoppable and provides native advertisements and ingredient promotions within your recipe card. Turning on the optional Chicory integration will add to your Mediavine earnings every month. What does Chicory look like? When the "Order Ingredients" button is clicked, Chicory opens up into a modal within your page which provides your readers with a pre-populated shopping list. 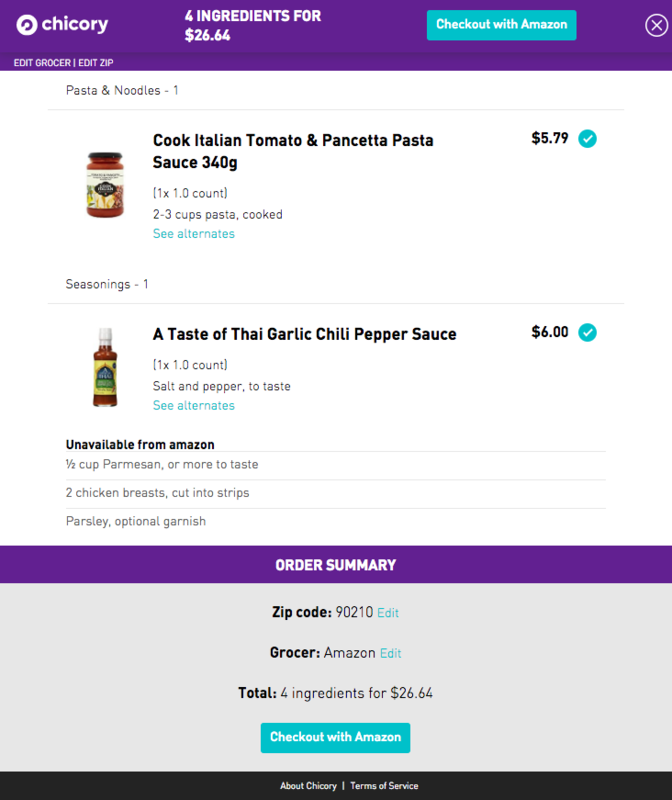 Users can swap out ingredients or adjust portions and then purchase the items from online grocers like Peapod or Amazon, to be delivered next-day. You also mentioned advertisements. What do those look like? Chicory notifies all of our recipe partners of new campaigns at least 24-hours prior to launch. That means you are able to opt in or out of a specific ad campaign, should your own brand relationships conflict. How do I activate Chicory on my site? To turn Chicory on for your site, simply visit your Mediavine dashboard and activate in the settings section of your dashboard. At that point, Chicory will begin analyzing your pages and a “Get Ingredients” button will appear beneath your recipe ingredients list, page by page. It may take some time for all of your recipes to import to Chicory, but if you feel you’re experiencing issues, you can contact their team directly by emailing amanda@chicory.co. What if I’m already a Chicory partner? What will this switch look like? When you’re ready to activate Chicory via Mediavine, simply uninstall/deactivate your existing Chicory plugin and then activate Chicory in your Mediavine dashboard. On the Chicory side, we’ll see this switch happen and we’ll take care of marking your account as such. Once you’ve made that switch, all of your dashboard data will begin to appear in your Mediavine dashboards and your Chicory payment will be incorporated into your Mediavine payment. For all existing balances you have on your Chicory account, we’ll make note of your date of switching and then pay out your Chicory balance up until your Mediavine switch during our next payment cycle. So, if you switch to a Mediavine installation on the 15th of April, Chicory will send you your balance through the 14th of April when we issue April payments, during the first week of May. What do I do if I’m not seeing Chicory on my site? There may be a number of factors affecting your Chicory installation, but our team is on call throughout the day reviewing and solving any issues that come up with our recipe partners. Upon your initial Chicory install, it may take a few moments for our “button” to appear on your posts, but if you believe that there is a larger issue, please contact our team--email amanda@chicory.co. Can I disable Chicory on a post? Yes! Chicory offers a variety of opt out options. If you need to opt out of an entire campaign, Chicory can update your preferences on their end. This option is best if you need to opt out of advertisements based on the brand being promoted. To opt out, you can reply directly to the Chicory campaign announcement email, which are sent the same week that new a campaign goes live. If you can not locate the email or you see a campaign running on your site you need to opt out of, email amanda@chicory.co, making sure to include the brand name or campaign in the email. If your opt out is in regards to a dietary restriction, Chicory can update your campaign tag preferences on their end. 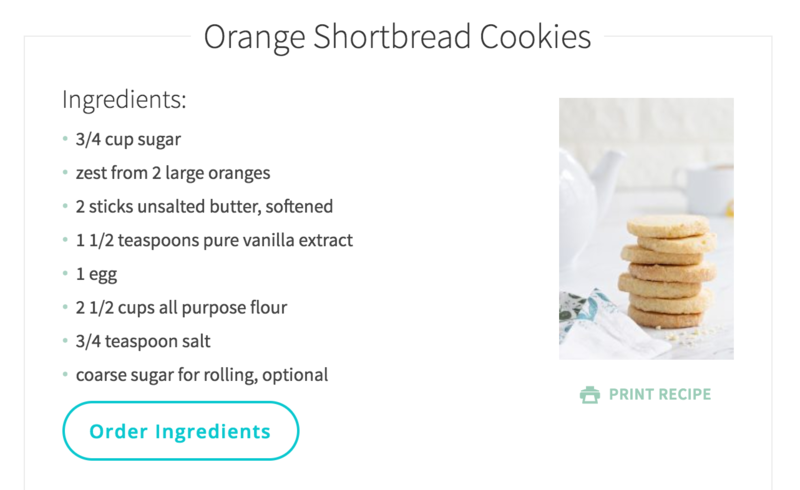 This will allow them to select tags for ingredients or products that you would like to exclude from running on your site. Campaign tags denote ingredient categories such as meat or dairy. Chicory offers these options so that if you’re a vegan food blogger, you never need to worry about opting out of a milk or chicken ad campaign, etc. Contact Amanda (amanda@chicory.co) who will help choose the best option for you. Who should I contact with my Chicory questions? Check out our website or blog, or feel free to email our team at any time! We look forward to working with you!